After the launch of Pay Per Second Billing on Postpaid by state operators MTNL and BSNL now its time for Private operators to join the Pay Per Second Postpaid league. India’s leading GSM operator, Vodafone Essar today introduced the most awaited Per Second Billing for its postpaid subscribers in Mumbai and Chennai circles. Vodafone’s Pay Per Second Postpaid Plan comes at fixed monthly rent of Rs.199 (Free 2000 seconds for Local Calls /Month) and Rs.299( Free-12000 seconds Local & STD/Month) in Mumbai circles hence Chennai customers have it even better at an annual rental of just Rs. 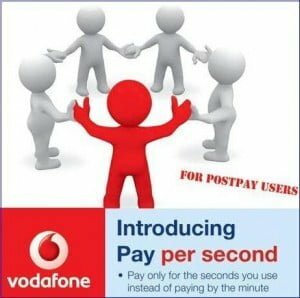 63 (3000 local V2V Seconds free )(Chennai and Rest of Tamil Nadu) Vodafone to Vodafone calls)With one time conversion fee of Rs.551. With all above Plan Mumbai Customers can make all Local and STD calls to any network at 1 paisa per Second any where in India , Chennai subscribers are charged 1 paisa (Vodafone to Vodafone Local calls) and Vodafone to other 1.5paisa per second for local call.